In next movie Prof. Dr. Max Welling gives the latest developments in Machine Learning also related to recruitment. 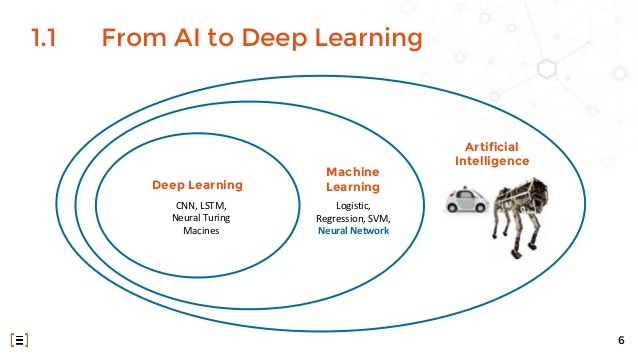 Deep learning is a machine learning method, as machine learning is a part of artificial intelligence. A child is learning by classifying objects. For example the child makes clusters like chairs and even if see’s a chair what is not exactly the same as the chairs the child saw before, he can classify to the same group. The same example but now the father tells (labels) the cluster of chairs as “chairs” so the child can recognize chairs without seeing the same chair before. Now there is also interaction involved. The child push the chair and it falls down or the sit on the chair and stand in the chair and the child learns from it. On the end of the movie somebody in the audience asked about a model- and data driven approach. In the model driven approach the art is to create algorithms and test them with data where the outcome is known. In the data driven approach, deep learning is used. Simplified it means that some kind of “blackbox” (the neurons) are trained with data where the outcome is known. In other words the algorithms (values in the neurons) are generated and not build. The art here is to design the right setup of the “blackbox”. For example you have a serious amount of CV’s and from every person in the CV you know his career path in the 2 years after providing his CV. With the model driven algorithm an algorithm is created on these serious amounts of CV’s (called the the trainings data). The algorithm can predict with a certain error the career of other CV’s. With data driven approach (deep learning), the blackbox creates the prediction algorithm with a certain error. This seems much easier but in practice there is much more training data needed and much harder to configure. In the movie Prof. Welling suggested to combine the 2 approaches which is of course by far the best but also most time consuming. Personally I really liked how Prof. Welling explained machine learning and I do think there is a great future for machine learning in recruitment. Below some active challenges I mentioned in the industry today. Small companies have challenges to find employees that fit in “small company culture”. This challenge may be solved to predict with machine learning based on CV and preferable more data, if the candidate will fit to a small company better than a well known brand (big company). In the case machine learning can make a better match with well fitting company in consideration taken that besides of hard skills also company culture is matched. For small companies it means more and of course better candidates. For big companies there are less but better fitting candidates. Jobsites have a challenge to make the matching better then just a selection for hard criteria. Social media and other way of referrals are becoming more and more popular and this is going on cost of traditional job sites. Probably jobsites need to deliver more value which means a better match. By connecting for example personal social media data (with approval from candidate) with CV’s on one side and vacancies on the other side, a predictive algorithm can be developed which improve the match so the error is less. It is very attractive for the company and for the candidate as well. In both challenges you can use model- and data driven approaches, eventually next to each other.